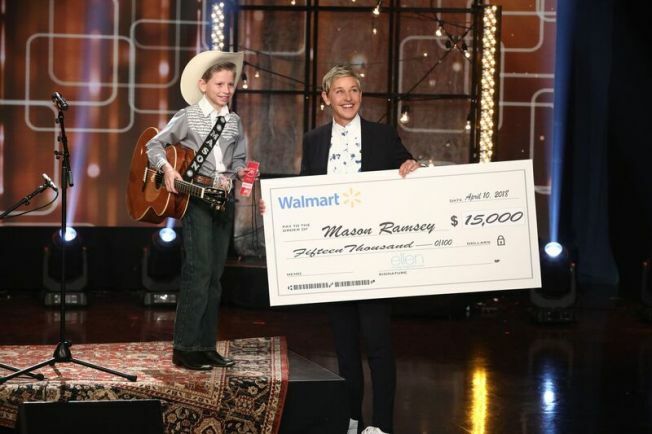 An 11-year-old yodeling sensation from Illinois who went viral after his performance in a Walmart appeared on “The Ellen DeGeneres Show” show Tuesday. Mason Ramsey, an 11-year-old from Illinois whose version of a Hank Williams classic has been watched more than 50 million times on YouTube and has spawned multiple remixes, is releasing his first album. Ramsey's EP "Famous" includes both country classics and new songs. It will be released on July 20. It includes "Lovesick Blues," the song that made Ramsey an overnight internet sensation. Ramsey, who was raised in the small town of Golconda, has been singing since he was 3 years old. He had been performing in nursing homes around his hometown when the viral video came out in April. Now he's signed to Big Loud Records and Atlantic Records. He has performed at Coachella, Stagecoach and the Grand Ole Opry.